A protest in Jerusalem against war with Iran. Credit: Jillian Kestler-D’Amours/IPS. JERUSALEM, Sep 1 2012 (IPS) - Parviz Barkhordar says he loves both Israel and Iran. For many, this dual affinity might seem contradictory, but according to Barkhordar, it makes total sense. Born in Tehran, Barkhordar left Iran for Israel at age 16, and got a degree in electrical engineering from Technion University in Haifa. After then returning to Iran for one year, he immigrated to the United States. In 1995, he moved to Israel permanently. 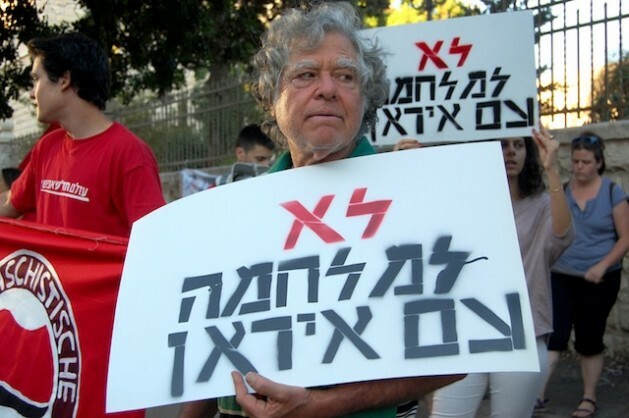 Today, Barkhordar hosts a weekly political radio programme on Radio Radisin, a private Farsi-language radio station that was established four years ago near Tel Aviv. Broadcasting online and on satellite radio, the station often receives calls from listeners in Iran. For months now, the Israeli news cycle has been dominated by talk about an “Iranian threat” and whether or not Israel would strike Iranian nuclear facilities. Many analysts have predicted that Israel would attack Iran before the American presidential elections in November, when public condemnation would be politically costly for U.S. leaders. Last week, Israel submitted a letter to the United Nations Security Council arguing that “complacency in the face of Iranian hate speech and incitement (against Israel) is dangerous” and that action must be taken. In turn, Iran’s deputy envoy to the UN stated that Israeli threats to strike Iran’s nuclear facilities violate the UN charter. In Israel, the response to a potential Israel-Iran war has been mixed. According to a July opinion poll conducted by the Israel Democracy Institute (IDI) and Tel Aviv University, known as the Peace Index, 61 percent of Jewish-Israelis don’t think that Israel should attack Iran without help from the United States. The survey also found that 60 percent of respondents believed that Israel should accept that it can’t prevent Iran’s nuclear programme, and should instead change its policies to reflect that it may soon no longer be the only nuclear power in the Middle East. While the Israeli government has never officially acknowledged that it possesses nuclear weapons, and maintains a policy of “nuclear ambiguity”, Israel has long been suspected of being the region’s only nuclear power. Israel has also refused to sign the nuclear non-proliferation treaty. “The (Israeli) government is trying to terrorize its own people and to make them believe that there are no options. But we know that there are options and this war is the worst scenario that we can have,” said Israeli activist Guy Butavia, during a small demonstration against an Israeli-Iran war held in front of Netanyahu’s home in Jerusalem. “The crucial thing is to pressure from inside and outside. From inside, I don’t think it’s going to make the difference. But from outside, I think it’s very crucial: from the U.S. and from the Europeans. Not only this war, but all the policies that this government is doing,” Butavia told IPS. Earlier this month, the Israeli army’s home front command began distributing gas masks to Israeli citizens free of charge. The first such distribution took place in Israel in 1990, on the eve of the first Gulf war in Iraq. “I think nothing will happen. It’s just media panic. Both Israel and Iran are just talking,” said a 69-year-old Israeli man named Yitzik, who only gave IPS his first name, as he waited to pick up a gas mask at a distribution centre in Jerusalem, among about 100 other people. Israeli mother of two Rachel Tzionit who was also picking up gas masks for her family, said that she didn’t expect the Israeli government to act unilaterally against Iran without first getting approval from the United States. For Parviz Barkhordar, while he hoped the people of Iran wouldn’t be hurt by an Israeli military offensive, he said he had faith in Israeli political and military leaders to make the right decision. Mr. Barkhordar says he hopes innocent people won’t be hurt should the Israeli government decide to attack Irans nuclear facility(s). When has there ever been a time in a war when innocent civilians haven’t been hurt or killed? I have always believed that should there be a WWIII, it will start in the Middle East and will alter this planet forever.